It’s officially spring, and you know what that means — time for spring cleaning! While a deep clean of your home can be a daunting task, it’s definitely worth it; a good scrub can make an old room shine or keep your recent remodel looking like new. This annual clean-up is even more important for high-traffic areas in your home, like your kitchen or bathroom. At Cabinet World, we are dedicated to making your home look its best, so we thought we’d share a few quick ways to help keep your kitchen or bathroom in tip-top shape. Clear out your cabinets, refrigerator, freezer, and pantry and take inventory of the items on your counters and vanities. When you’re putting items back, make sure that they are placed in a way that lets you easily identify them (labels facing forward, please). Throw away any food items that are expired or freezer-burnt but don’t limit the expiration date checks to the kitchen! Makeup and skincare products don’t last forever and can be full of bacteria when they expire, so be sure to think about when these items were purchased before putting them back in your bathroom. The golden rule of de-cluttering goes thus: if you haven’t used it in a year, you’re not going to use it again. So look through your kitchen gadgets and donate those ill-advised infomercial purchases to your local thrift store. Either quickly finish the almost empty products in your medicine cabinet (excluding the medicines, of course) or throw them away. Makeup brushes: We’re often in a hurry getting ready and our makeup brushes and sponges are seldom cleaned properly after each use. This can leads to growths of bacteria in the bristles that cause acne and other skin woes. Try this neat DIY to sanitize your brushes quickly. Your company china: Plates and cups that aren’t used regularly gather dust that overtime becomes caked-on and more difficult to clean out. Give your porcelain a gentle hand-wash before putting it back in your cabinets. 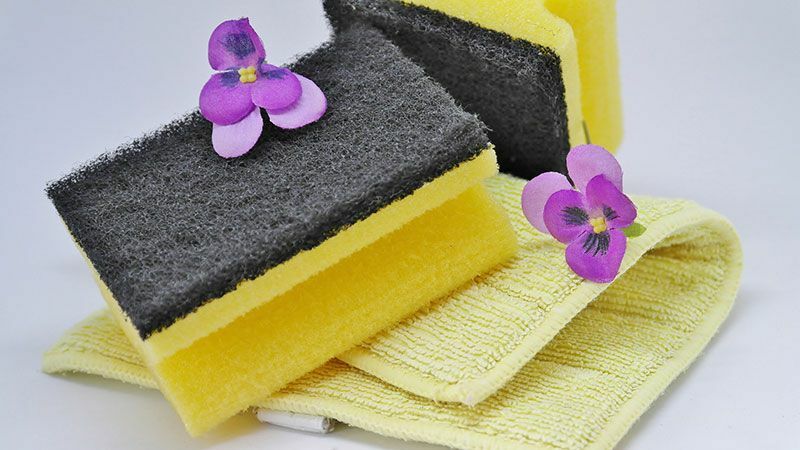 Pots and pans: Spring cleaning is a great time to give your most used homeware items a long soak to help them sparkle. Tablecloths, placemats, and bathmats: Wash any always-out fabrics in your kitchen or bathroom, checking for stains, tears, and worn areas. Pay special attention to hard-to-clean and oft-overlooked areas: Instead of immediately tossing your toothbrush (which you should replace if it’s more than 3 months old), use it to scrub the grout in your tile walls and backsplashes. Don’t forget to clean less obvious spots like faucet and shower heads too! Take note of areas that need improvement. Cabinet doors squeaky or grunge-y despite your best efforts to clean them? Bathtub turning that yellowish shade that screams of old-age? Is your vanity too dimly lit? Maybe it’s time to replace or remodel. Cabinet World has solutions for all your kitchen and bathroom woes, whether you need more light in your food prep area and are interested in installing under-cabinet lighting or want a better way to organize the items in your cabinets or shower. We work with you to help make these changes happen your way — you can have us take care of the entire project, provide supplies for your favorite contractor, or guide you through a DIY. Jump over to our idea books to see the full-range of what we can do for you! What’s your best spring cleaning tip? What parts of your kitchen or bathroom would you like to remodel or replace? Join our Friends & Family Network to earn $200 for every new customer you refer and get access to exclusive drawings!